Okay, we admit it... our heads have totally been in the clouds! It's time to get back to earth, and some more gardening... we are so happy that June's Flower Block of the Month was released in June! This month's design is roses, and is titled "Love" but it really should be called "The War of the Roses" because we struggled so much with the design. Roses are so special, and we wanted this to be just perfect! 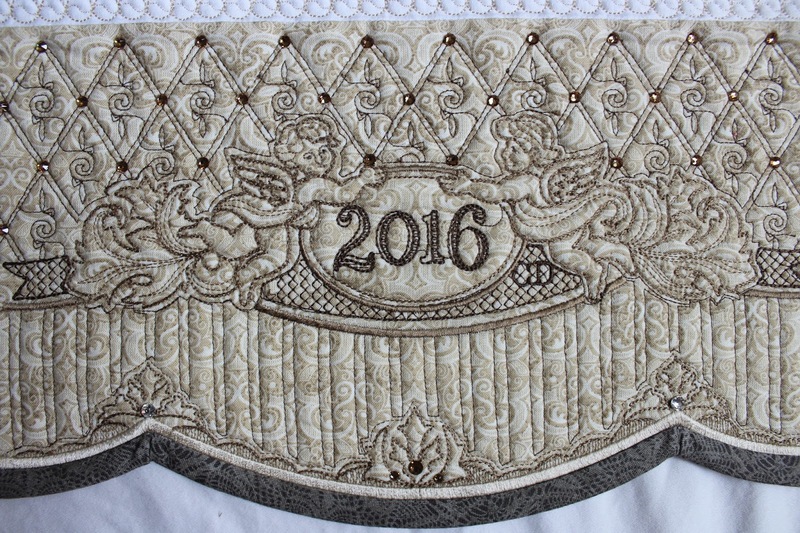 Each successive stitch out is given a letter starting with A-- this design made it to G before we were happy. 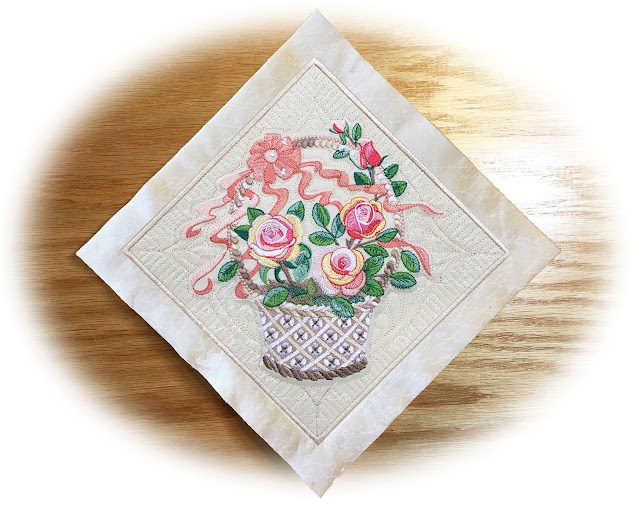 You can see the detail in the pretty basket below-- and the leaves all have that jagged edge that is so typical of roses. There's even a couple of thorns! The color chart this month explains how to change the bow and roses to YOUR favorite colors, if you like. It's not a good feeling to get back from vacation and realize you are behind on almost everything! But that's what summer is for, I guess. Le Petit Jardin finishing kit is also coming along, and the Summerhouse BOM 7 will be mailed tomorrow, right on time. We'd love to hear what you are up to this summer as well! You can easily leave a comment but just using the "Anonymous" option. 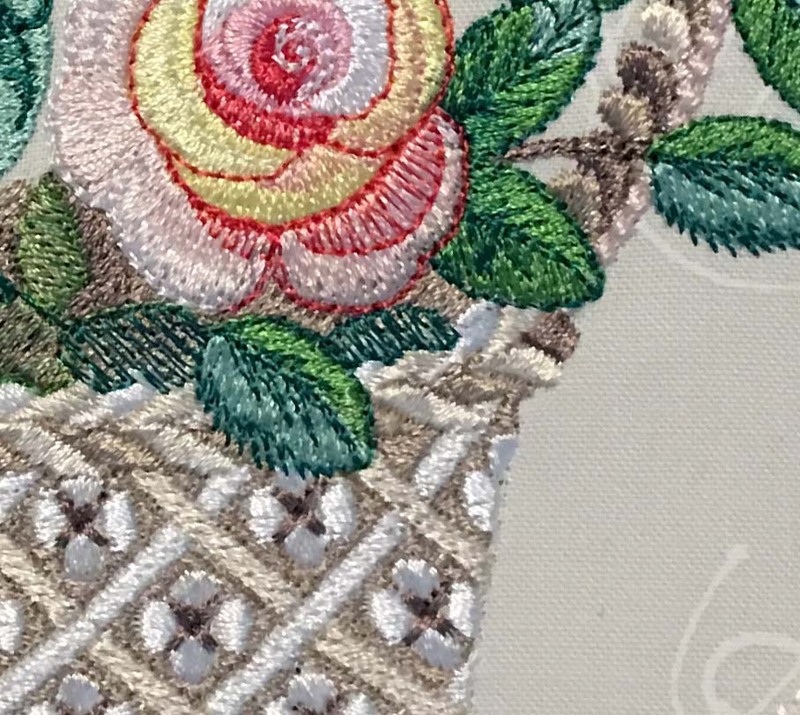 Or consider subscribing to this blog, if you enjoy a bit of machine embroider blather once a week. Since the big finish of A New England Album, how long did you think it would be before another project got started... or two or three or four? What’s worse, my favorite embroidery machine is at the shop for a clean up, so opportunities for quilting now abound. Here's a few peeks of what we've been piecing together this week. Here is one of the projects coming along for the Summerhouse BOM. If you don't know, this is San Francisco Stitch's first quilt block of the month-- no embroidery-- and we are very excited about it. 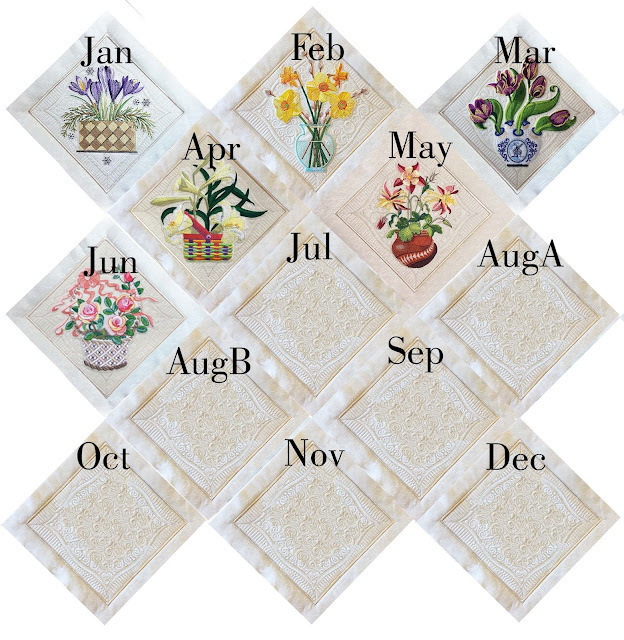 We have a quilt block each month AND a themed project. 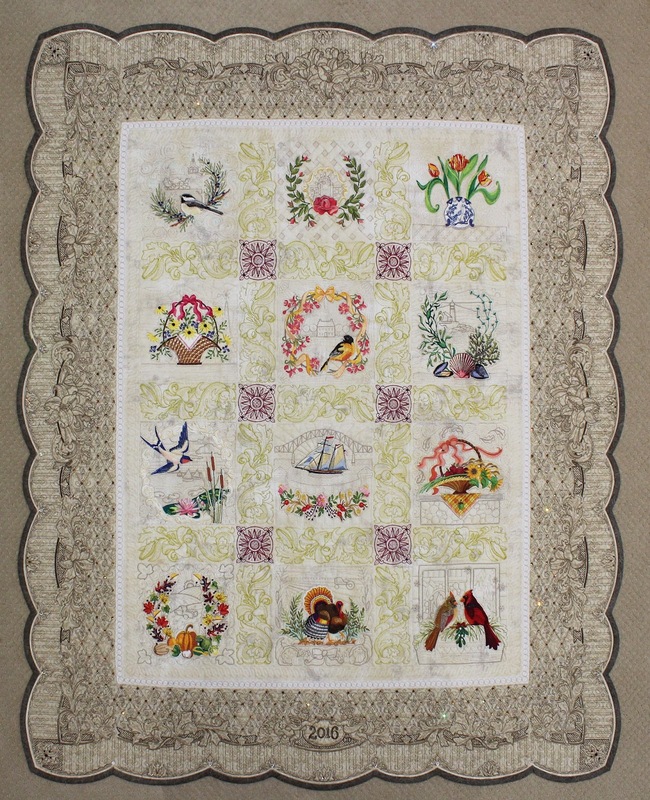 This lighthouse block is one of our favorites, and what would be better than to have one hanging over your bed? Sweet dreams, guaranteed. And how about a fence for Le Petit Jardin finishing kit? 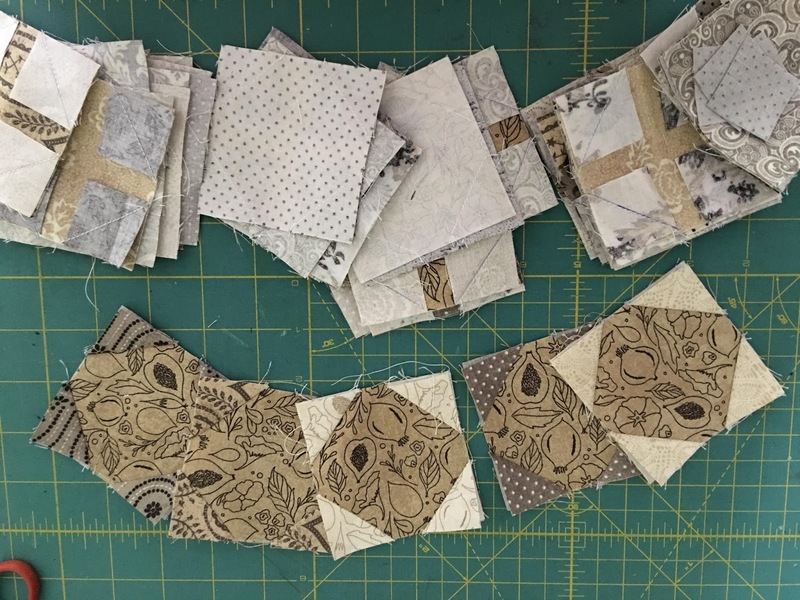 Our center is all pieced together, (Did you get your free tutorial?) and now we are going to embroider an arbor gate and maybe some bunnies and climbing roses to surround our vegetable gardens... stay tuned. 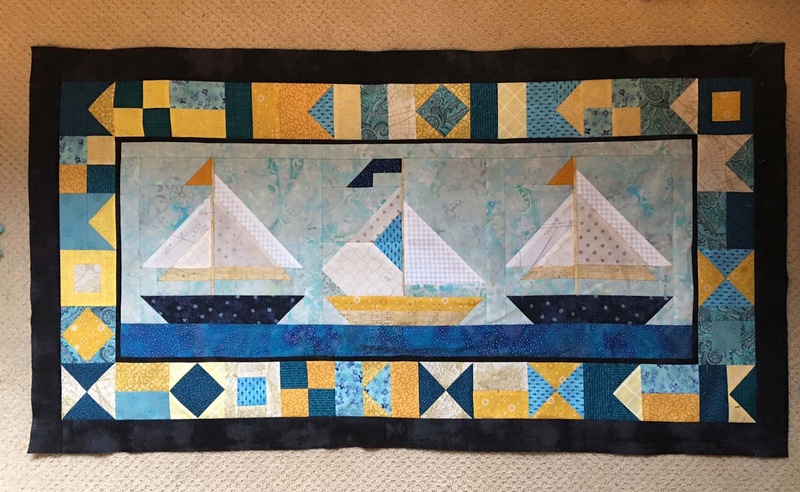 And since we’re on a nautical bent, this is my challenge quilt I mentioned last month when I got stuck at the airport for six hours! 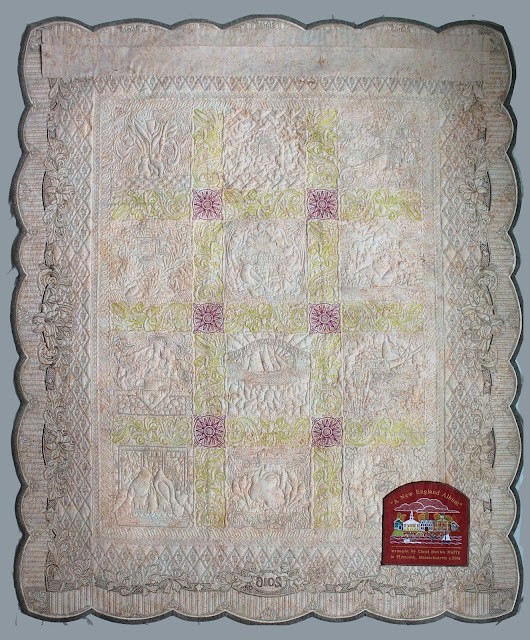 This is just a little 25" square piece that is for my local quilt guild's show in the beginning of August. 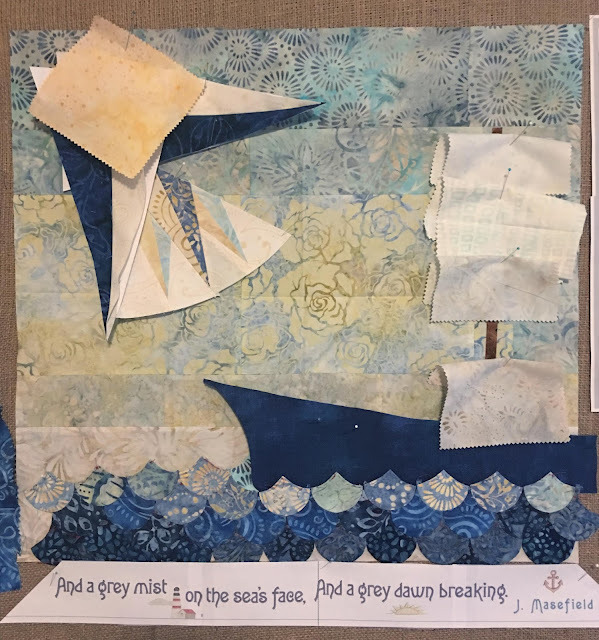 To enter the challenge, it needs a star, the colors navy and lemon yellow, and a sea theme to be eligible for the contest. One of the themes suggested was John Masefield's “Sea Fever” poem. I was forced to memorize and recite it for a speech class in tenth grade... it did not go well, and I’m still not over it! But when I saw that it was on the list for a challenge theme-- I truly impressed myself with how much I remembered. Like where are my car keys and cell phone, though? And, of course, the poem is going to be embroidered in the border, because no quilt is ever complete without machine embroidery. So, the clamshells are finished for the water, but I told myself if I don't have a star by the end of the month, it will never be done on time. Stitching up one of those big mariner’s stars is on my bucket list and paper piecing is really the only way to do it. 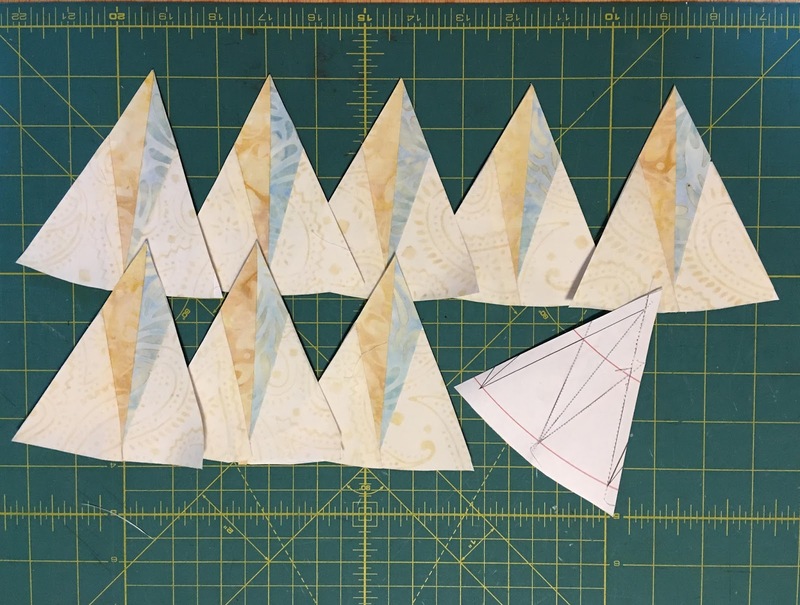 I really don't mind paper piecing, but don’t do it often, so every time I do, it seems like I have to relearn it all over again. I drew the star in Adobe Illustrator and printed it out multiple times. The points are pretty extreme even for the precision of paper piecing. 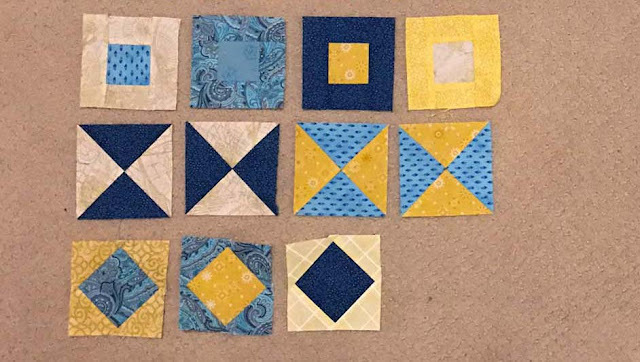 But I only need half a star for the corner of my layout, so I made nine of these when I really only need four, thinking I'd get some perfect ones. 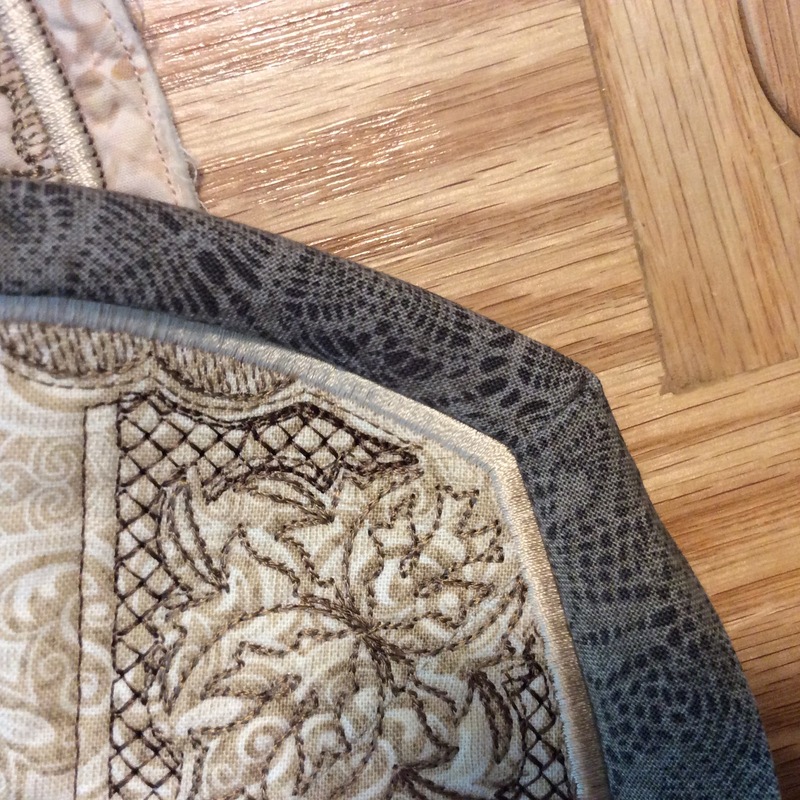 It seems to me, you don’t sew right on the line, but a thread's width into the seam for perfect results, but I do have to figure this out every time. Here's my best one—not bad! We live near the Cape Cod Canal and this week, the tall ships all came through for Sail Boston. Inspiring to say the least, and a good omen for my challenge quilt! 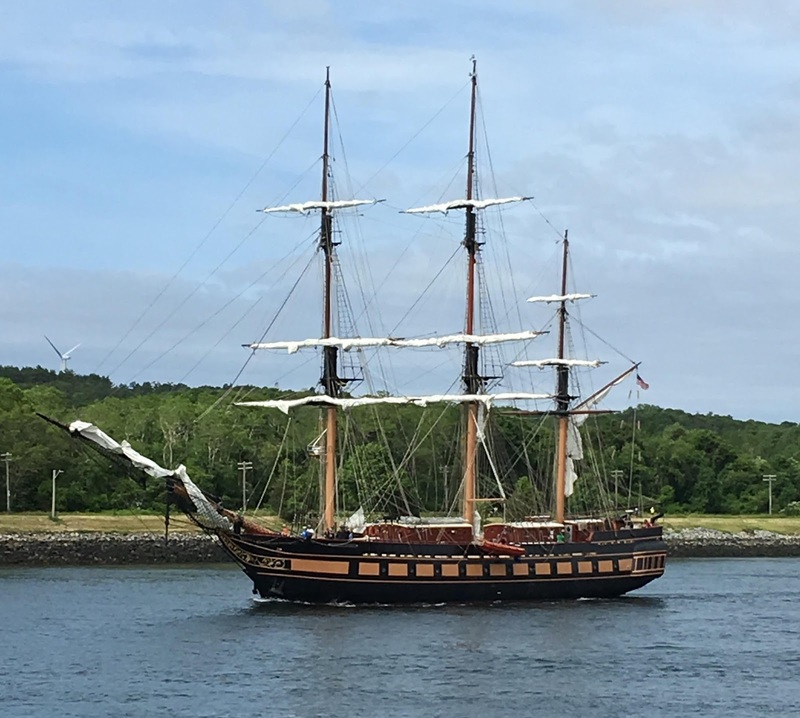 This is the Oliver Hazard Perry out of Newport-- I found out later it was built fairly recently. How wonderful that there is still enough interest and know-how to keep these gorgeous ships on the water. 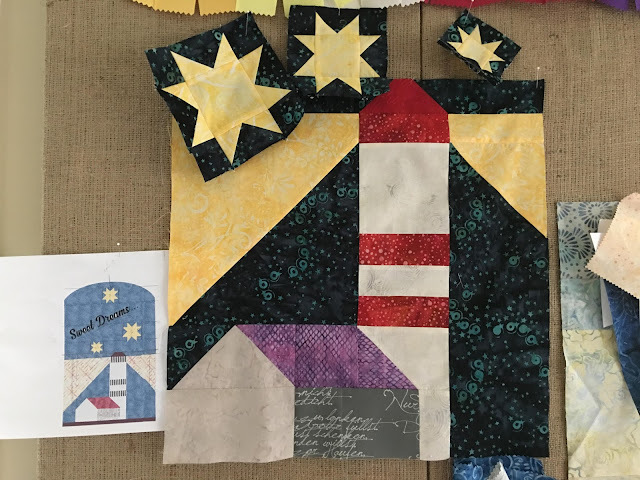 Finally, this is the beginnings of another challenge quilt... a challenge that tickled our fancy, but our lips are sealed, just until the likelihood of finishing it is more certain. 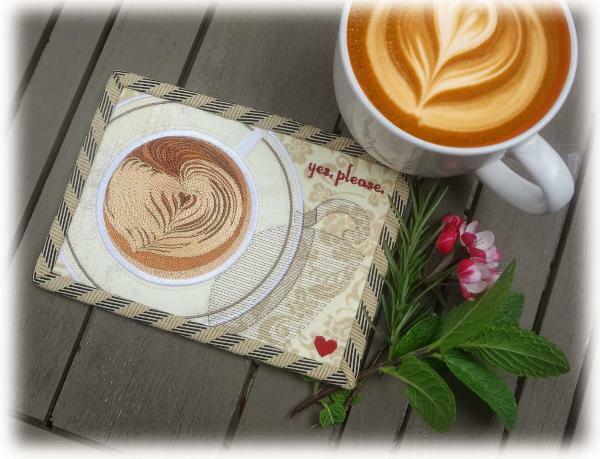 The deadline is next April, so this one will happen mostly over the winter, and we are using our coffee art mug rug GIANT SIZE in it-- (it's going to be a celebration of caffeine). The first thing we really need is 156 of these "snowballs" for the borders... its relaxing and fun to do them at night. So that's just a little bit of what we've been up to... Thursday this week is a quick trip up to Vermont Quilt Festival to visit the New England Album and see how it fared. 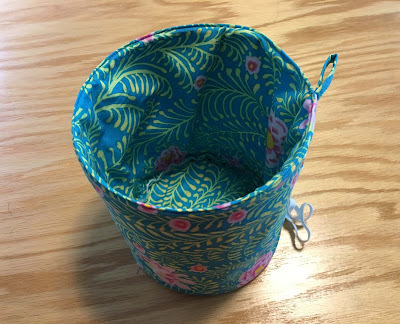 Look for our next post as we take the road trip up... its absolutely our favorite summer show, and there are quite a few sewing stores on the way! There's something GRANDE in Le Jardin! Since we are wrapping up "Le Jardin Sow-a-Long," I can't resist sharing this cute story about what's growing in my REAL garden! Last night as I was making dinner, my husband ran inside and yelled, "Grab the camera, and come outside RIGHT NOW!" I love surprises and when he saw the look of delight on my face, he added," You are NOT going to be happy!" Well you'd think a person would know you really well after 34 years of marriage, but instead of being unhappy, I was EGG-STATIC! I knew my garden looked nice! So still thinking I was not happy, my husband started to think of various ways to get rid of the creature, all very unwise. It wasn't any ill will towards the turtle, but just that he knew I worked so hard to plant caladium bulbs in there, which may or may not have ended up as a turtle snack. 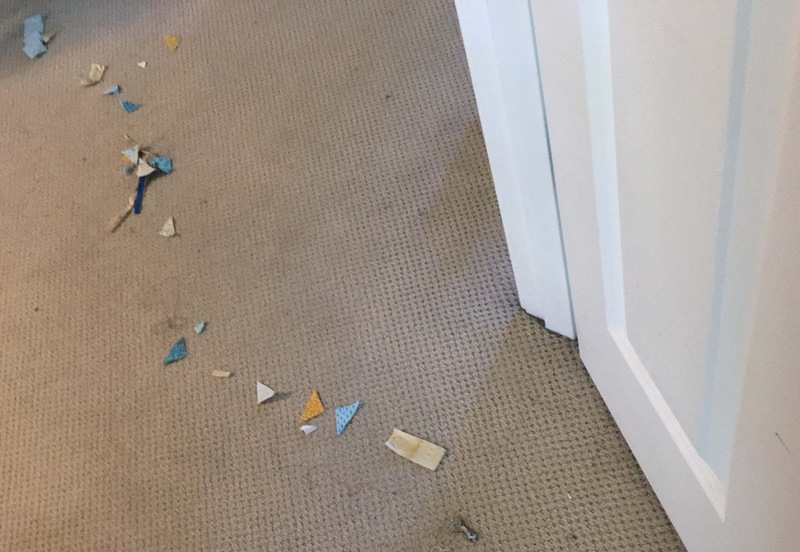 I finally convinced him to leave it alone... he didn't understand that when dealing with a MOTHER, you could throw the thing in the car drop it off six miles away, and even if you were still in possession of all of your arms and legs, she would be back in the morning. I assured him, that to hide the eggs, she would put every last bit of mulch back where it belonged, neat as a pin. I only took one picture out of respect, but I was able to peek out of a window and watch the progress... it took two or three hours but the size of the hole she dug was impressive, at least a foot deep. Thinking we still had time to go before the magic moment when the eggs were laid, we went for a walk and when we came back she was gone. The clean up job... not so much. A quick Google and I discovered the babies will hatch in 80 days...that's as close to a grandma as I am for now! So that's what's growing my gardens... what's growing in yours? At the end of this year-and-a-half journey I feel nostalgic, so read on for some finishing tips, mixed in with some metaphors about life, or just quickly scroll down for some detail photos and be on your way. The reason this project started was because I always wanted to make one of those beautiful, hand turned Baltimore Album quilts. After years of trying, I had to face the facts-- I STINK at hand appliqué. None less than Karen Kay Buckley, Mimi Dietrich, and Rosa Rojas all tried to help me with all manner of scissors, papers, and glue to no avail. So I realized the only way I was going to get the "look" was by digitizing machine embroidery. The lesson here is, if you lack something, consider it an opportunity to find out what you CAN do! The final product is better than I envisioned... the piece just seemed to happily come along bit by bit and became what it wanted to be. 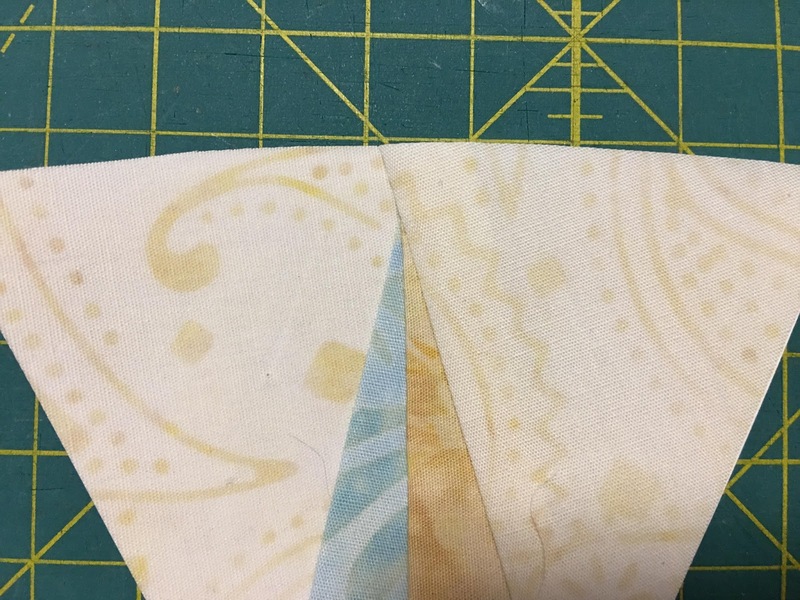 Fat Quarter Shop always had an extra piece of the backing fabric when I ran out, no coffee spills, no epic embroidery machine fails when I left the room. In just looking at it as if seeing for the first time, it reminds me of an ancient pictogram, or a medieval tapestry of daily life. And as ironic as it is, it’s made on the cutting edge of computer aided design. After finishing the large borders, there was an empty space between the blocks and borders. I decided to fill it with "pearls" and "rope" embroidery and added about another 40 hoopings for myself! I had to use a smaller hoop to get more control over stitching them on straight. Little by little at night did the trick and the embroidery was finally done. A great feeling to take it off the machine for the last time! 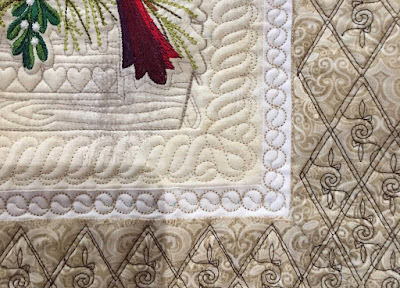 I struggled with the idea of washing and blocking, but it really needed it—as flat as it was after all those hoopings, it did have some noticeable hills and valleys. The fabric was not prewashed, but the colors were so pale to begin with, so no fears there. It was all those fire engine red embroidery threads from every manufacturer and country on the planet that worried me. I googled how to best do it... while some used the washing machine, EEK!, adding a tablespoon of Dawn to the water was a common theme. Dawn is said to contain a chemical that does not allow the re-depositing of loose dyes. I threw in three color catcher sheets for good measure and used really cold water. All those thread dyes held fast! Then, to dry it quickly, I did put it in my washer for the delicate spin cycle—I stood and watched as my washer slowly built up to full speed. I could only stand it for a about a minute, but it really did really get much of the water out. The piece was alarming shrunk now, but I pulled and pinned with about 450 T-pins to a foam insulation board, and bought a $14 laser level (it shoots out 2 perpendicular lines) to square it up-- well worth the money. Then it was fans, fans, fans. It was mostly dry in about 6 hours, but it took a solid day for it to be bone dry. The results were utterly fantastic—I never thought my thin white borders could be that square. I will be blocking ALL of my work from now on. Crystals... Back in the day, my daughter was a figure skater for ten years. She never made the Olympics, but opportunities for sewing were abundant. There was a saying: If you can’t dazzle the judges with your performance, blind them with crystals. I can't deny there's a bit of that philosophy here! Whether or not to crystal the New England Album was a topic of dinner conversation on quite a few nights... at least one family member being adamantly opposed. I am sure the fine arts community would be appalled, but they would also consider this a demented craft project anyway. Art or craft? I was at one time insulted by this question, but at this point in life I really don’t care how my work is labeled anymore. All I ever wanted to do was make something beautiful. And I wanted crystals. I bought the first crystals in Michaels... they have a good selection, but then, since I needed over 500 of them, I ordered them for a fraction of the cost from Fire Mountain. Warning: Fire Mountain has so many colors and sizes, do not go to their website unless you know exactly what you need! To glue or to hot fix? I tried the glue for the first time-- easy to do, not as messy as you'd think. I used a pin to just apply a tiny dot of glue to each crystal... you can still pick off the crystals days later if you have a change of heart, leaving just a tiny bit of residue. But I still prefer hot fix-- just lay the crystals down and heat for about ten seconds. 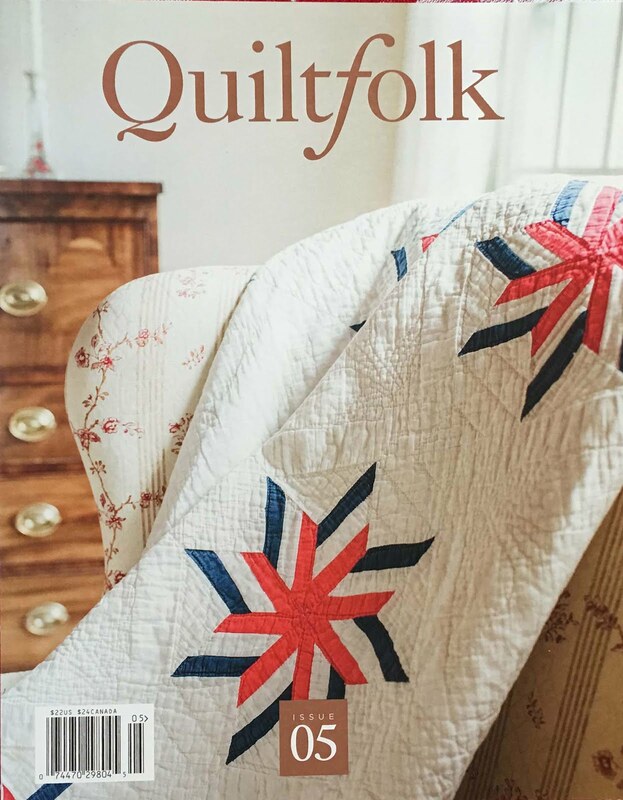 I'll let you know how many fell off of each method when the quilt returns! WARNING-- it is really hard to know when to put that Bedazzler tool down-- apply one crystal in one place and you are then committed to doing two or three hundred in all those places! Use caution! And the label… a beautiful machine embroidered one, of course! 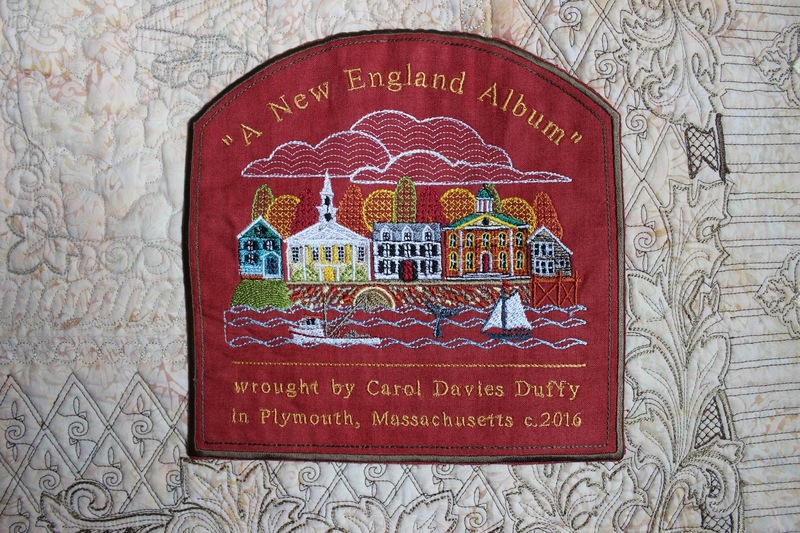 So after a year and half of work, “A New England Album” is now done, rolled up, and entrusted to UPS to take it to the Vermont Quilt show and who knows where else after that. I can't deny a ribbon at any of these would be a thrill, but I've learned that to be a very random occurrence and have probably already won more than my fair share. 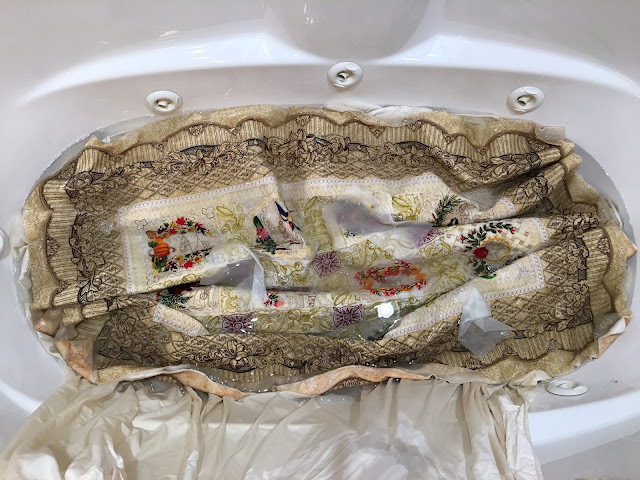 I sometimes wonder what the purpose was to pour all this love into 2000 square inches of fabric, into a quilt that is too stiff to provide any comfort or ever warm a loved ones shoulders… but I hope that it will still warm many hearts. I am now sweeping up the dust in my sewing room, and enjoying not having a project for a while… knowing me, that won’t be for long!! When finishing up our Summerhouse quilt, we wanted to do something special for the border. 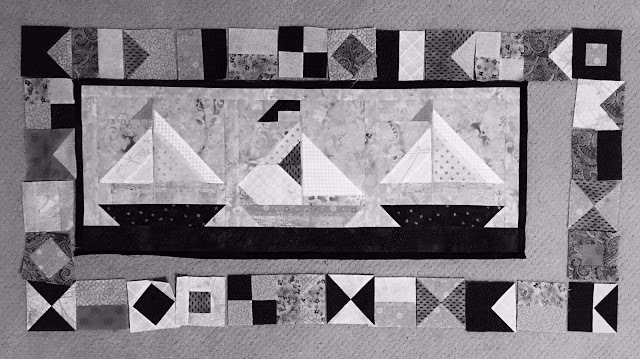 A Nautical Flag Block had hit the dust for being overly complicated—but the potential for a border really struck us! 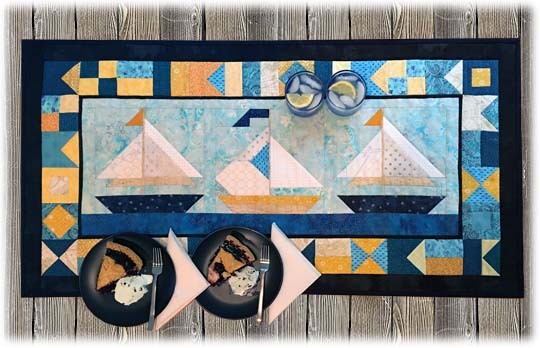 It surprised us initially that they all seem to be based on quilt blocks – but thinking it over, DUH!, in the days before cellphones, radios, and even morse code, what did sailors have for communication? Not much more than strips of fabric and needle and thread. And you’ll notice, the rolling deck of a ship is not suitable for curved piecing—only ONE block uses it—can you find it? And I’ll bet they didn’t have Karen Kay Buckley’s perfect circle templates, either. Our Regatta table runner was crying out for a flag border. We started by adding a 1/4" navy blue border around our ships-- a flag border is nothing if not BUSY so think about it as a bit of visual protection for the main part of your design. We are using three inch blocks, the perfect size for a table runner. 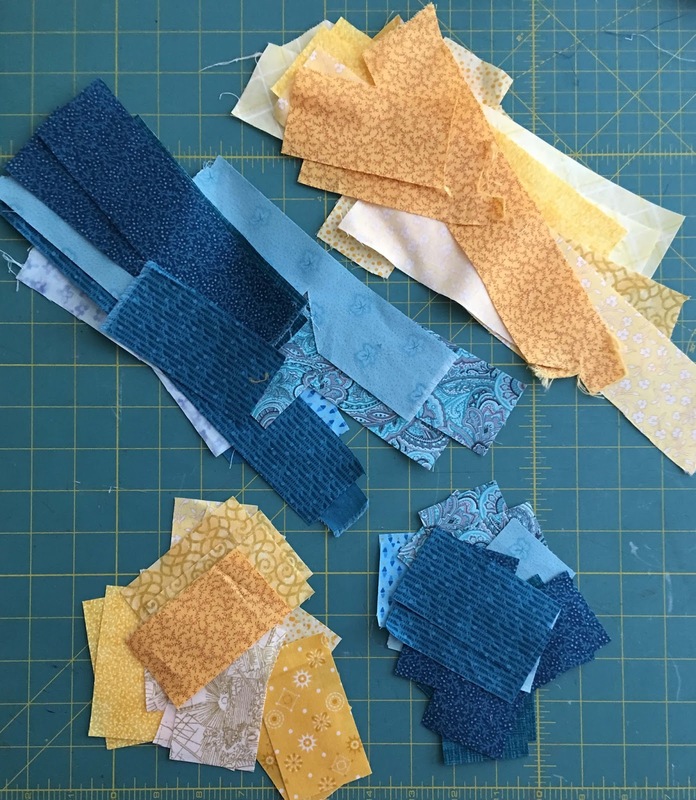 We’re sticking with our teal and yellow theme, so we pulled a bunch of scraps in those colors. Most of the flags worked out to have pieces with a 2" width. 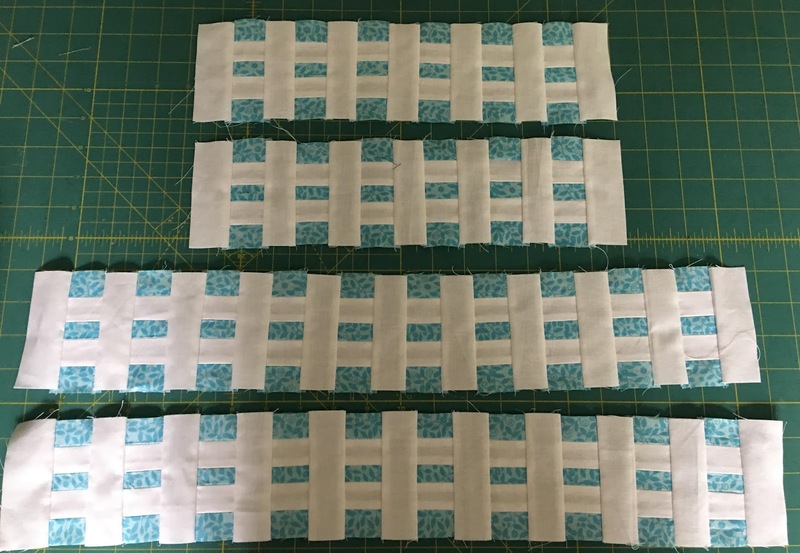 So, the first thing we cut was a bunch of two inch strips—many of the flags also use a 2” x 3-1/2" rectangle, so we cross cut some of those, too. We calculated that we’d need roughly 32 blocks, so here’s our strategy. Make ALOT of easy blocks and then make a couple of very high contrast fancy blocks to add interest and get a good mix of colors and shapes. First up, “K”: the simple double-striped flag-- so easy to make so we made eight of them, picking a light and dark value fabric for each and using our pre-cut rectangles. Then we made a bunch of flying geese, and stitched them to more of the rectangles.The checkerboards used strips that were then cross cut and rotated—very easy to do as well. … and here is my scrap catcher strategy-- my friend Tere, who is fully acquainted with "my process," made it for me out of my very favorite Kaffe fabric.... when she gave it to me, I initially thought it was to keep fat quarters in. I don’t know why I thought that, but even as a child I was trying to put the square block in the round hole. Back to business... we just made of few of these types of blocks below… not that they were so very hard to make, but just because we were trying to expedite the process. Why use a design wall when you can have a design floor? A design wall is for people with good shoulders.... the floor is for people with good knees. If you don’t have either, try a table. We reached 32 blocks in no time. We first picked four of the most striking favorites for the corners. Then we just picked one by one from each row, and laid them clockwise around the piece so that none of the same fabric was adjacent—harder to do than you might think! Once we had our first layout, it was very helpful to take a black and white pic with a smart phone-- you can easily see where dark and light values are congregating and adjust. We made some adjustments and this is actually looking pretty good now. 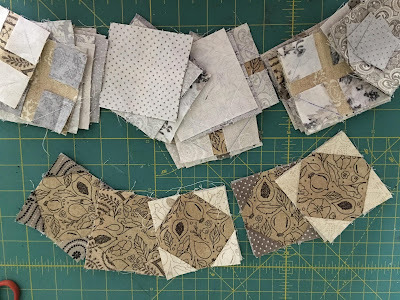 We sewed together about 4 or 5 blocks at a time, leaving a space in the middle of the top and bottom borders... the space is to add a final piece to make the border fit! Our sides worked out perfectly, but could have used the same technique. If you only have a small space to fill, just remove one of your rectangle pieces and make one that's wider. When sewing on your borders, pin the ends to match first, then pin the middle, then in between those pins-- keep doing in betweeners until your pins are about 2" apart. Pin on the border side of the project-- that way you can better see where points are when you sew. We first added the longer borders and then the sides. Having all those flags butted up against a binding seemed like it was really going to cramp them, so we added an additional dark border around the edges. And ta-da! Photoshoot time—my favorite! We bought a matching blueberry pie and lemonade—yellow and blue! Unfortunately, it has been raining here forever, so the picture couldn’t be taken outside and was photoshopped a bit. Maybe we’ll get another pie later this week and redo it.